Editor’s Note: This piece was initially published at Amy Wilentz’s website. Jean-Claude Duvalier is dead. I never met him. I saw him just once, at the airport in Port-au-Prince, in the early morning hours of a day that then seemed fateful: February 7, 1986. He was driving up to a US cargo plane, and then heading into exile in France. His whole family was in the car with him. It was a brief moment. He whizzed by and was gone. The next day hundreds of thousands of Haitians came out into the streets of Port-au-Prince to celebrate. Jean-Claude inherited this apparatus—secret police, corrupt ministers, frightened populace— when his father died. Baby Doc was 19. He had neither the wit nor the inclination to change the methods by which his father ruled; indeed, he profited from the corruption that surrounded him. Thousands more enemies were killed or fled during his fifteen years in power, while he lived in luxury amid a starving people. But too many were fleeing a wrecked economy, and eventually the United States government, which for years had adopted a permissive—if not cordial—attitude toward Duvalier, finally had had enough, and stepped in, and Baby Doc fell. When the dynasty was entering its final weeks, I was a young journalist living in New York in a neighborhood where many Haitian exiles then lived. Every day, they would gather on street corners on the Upper Upper West Side of Manhattan to read the exile newspapers and debate the timing of Duvalier’s ouster. I listened to them and read their papers, too, and decided to go down to Haiti to cover the fall, and that’s how I ended up at the airport, watching him leave Haiti. He stayed away for twenty-five years. For me and for the rest of us who watched Haiti open up after Duvalier’s fall, it was more than weird to see him come back. I knew people who’d been tortured in the infamous Fort Dimanche prison by Duvalier’s henchmen. I knew people who had lost whole families. I knew people who’d had to live in exile for more than a decade because of his persecution. 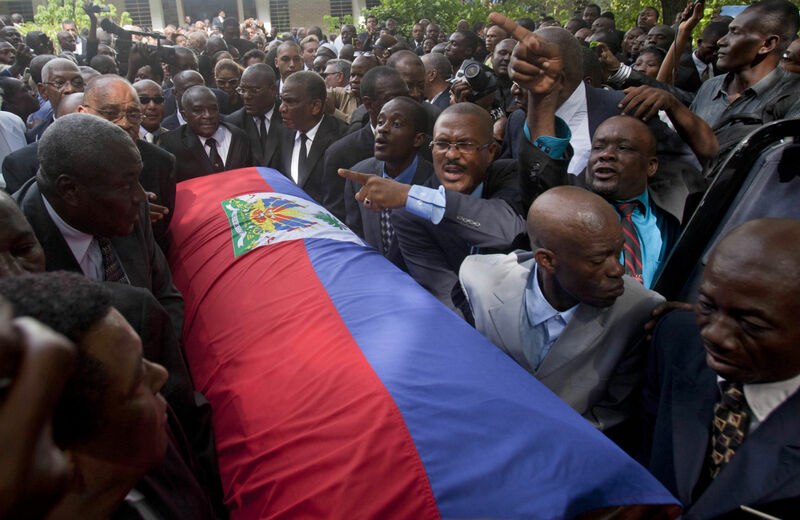 The whole quarter-century after his fall had been an attempt by Haiti and Haitians to recoup everything that had been lost under Duvalier: a sense of national pride, the standing of the professional classes, a national economy free from corruption, a real justice system, respect for human rights, freedom of speech. Duvalier’s cheerful and emotional welcome by Martelly, more than anything Martelly did or has done as president, made Martelly’s promises of democracy and openness suspect. Shortly after Martelly came to power, I spotted two paintings side by side, on offer in a sidewalk market next to a main boulevard that runs up the hill from downtown Port-au-Prince to the richer hilltop suburbs. On the left was President Martelly, on the right, Papa Doc, whose image had not been on public display in Haiti for more than two decades. I was astonished, and snapped a picture. I am sure there were buyers for the portraits because among a certain couche of Haitian society there’s a kind of nostalgie de Duvalier; these are people who miss the privileges they and their families had under the dynasty’s rule, and who trust that Martelly will bring those days back. Even now, there’s a good chance Martelly will soon be ruling by decree, as Papa Doc did, because the terms of many legislators are coming to an end with no legislative elections scheduled, three years after they were supposed to take place. Thus there may be no legislative branch, only the executive. But the corruption he and his father encouraged, and their political toolbox—authoritarianism, trumped up elections, distrust of free speech, corruption of the forces of order, and no justice—are the methods by which Haiti’s ruler still controls the country. The US government has supported Martelly. Only yesterday, Samantha Power attacked the Haitian opposition for standing in the way of elections. But the opposition has had good reasons for putting obstacles in Martelly’s way, not least the concern that the elections he hopes to organize will not include all parties, and will be overseen by an electoral council that is neither honest nor objective.